A retractable awning provides shade when you need it keeping you cool and protected from the sun’s harmful rays. But what about barbequing or relaxing under an awning or having your retractable awning out in the rain? You can barbeque under your awning provided your awning is installed at the proper height and your grill is maintained. Always clean your grill before barbequing to avoid excess grease and flames. When you install your DIY awning, take into consideration the best possible placement of your grill for when you are barbequing under your awning. Then you can determine the proper height for when installing an awning. 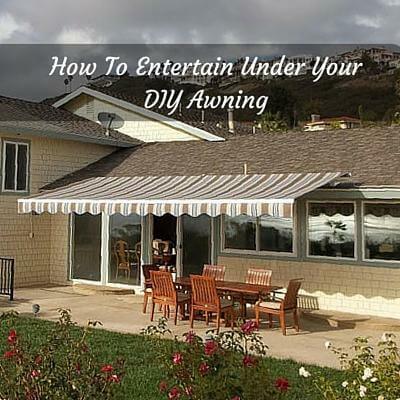 When it comes to outdoor entertaining under your DIY retractable awning on a rainy day it doesn’t have to stop. Baring a thunderstorm or gale winds, you can still enjoy your outdoor living area while experiencing a light rain. The key is to have a proper slope or pitch that will allow water to run off the retractable awning without pooling on the fabric cover. We recommend you retract your awning when not in use in case there is a sudden change in the weather. Are the weather conditions right for entertaining under your awning? Well, a good rule of thumb is if you can sit on your porch or patio and not be bothered by soft winds or light rain, then there is no need to retract your DIY awning. Using your grill under your awning can also be safe, provided your awning was professionally installed to the right height and pitch. No worries, you can enjoy a good BBQ in your outdoor entertaining area even on a rainy day. If you are interested in enhancing your outdoor barbeques, gatherings and relaxing experiences on your deck or patio with a DIY retractable awning, then be sure to check out our awning designer feature and customize yours today!